"Black History Reading Comprehension Fun - Kindergarten" contains five different reading passages designed for PreK, kindergarten and early first grade reading levels. 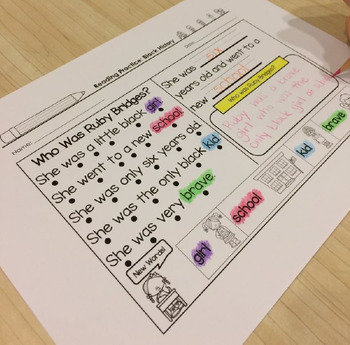 These passages include new words, dots under the words for little learners to touch as they read each word, and quick and easy comprehension checks. This can help you teach your students about important figures in American Black History in a fun way! Some of the topics include: Ruby Bridges, Martin Luther King Jr., Rosa Parks, and Barack Obama. All of our templates are printer-friendly, in black-and-white. 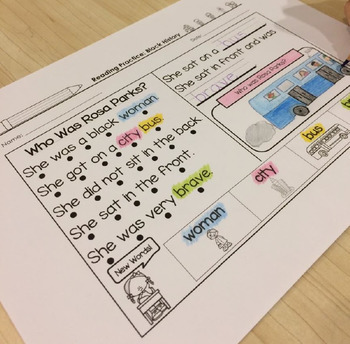 We like to have students practice reading the passage, then reread and highlight the new words in the passage, and finally complete the comprehension checks. 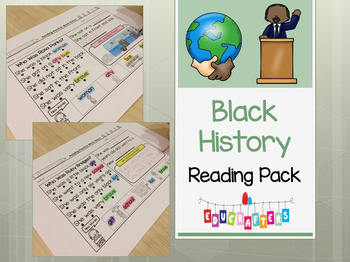 This pack is the perfect supplement to your teaching of Black History Month (February), biographies on influential figures, or to provide some fun with guided reading and reading comprehension! Take a look at all of our Kindergarten Thematic Units! Check out all of our Seasonal Crafts for more Kindergarten fun! Be sure to follow our store! Just click on the green “Follow” star at the top of this page or our store page to follow our store, which will notify you first when we post new items! All new items are 50% off for the first 48 hours they are posted! You will also receive customized email updates about our store products!